Make sure your central AC unit is prepared for summer. Here are a few simple things you can do to ensure your AC system is ready to keep you cool in the heat. With proper maintenance and care, a central air conditioning system should last 12 to 15 years. 1 Unfortunately, many homeowners don’t pay much attention to their AC until something goes wrong. And like many household problems, it’s much more expensive to do a repair than to prevent problems before they happen. A few minutes spent prepping and inspecting your central air system before the heat of the summer hits is not just a good idea, it can save you money and prevent a shutdown just when you need cooling the most. Being familiar with your system is critical to understand any problems that arise. So the first thing is to get a little learning under your belt. You should know generally the parts of your system and how they function, including what they look, sound and feel like (vibration, temperature) when the system is running normally. If you haven’t done so, take a good look at any user material you got with the unit. Don’t have that? Take a look online for your brand of central air. Reputable manufacturers post copies of their materials online and some even have “knowledge centers” for their customers to use. Before you set out to troubleshoot and inspect, you have to know the names of the different parts of your system, where they are, and what they do. Start online with general info and then learn where those items are in your specific set up. If you have trouble finding what you want online, check with a local dealer, they can often provide copies. Next, locate your warranty or look at a copy online. This is important before you take any action because you don’t want to violate the terms. It may have requirements about maintenance and inspections that you are unaware of. You’ll need your model number and other information about your unit. This is also needed if you have to contact an HVAC technician – look for an ID or information plate on the outside unit. Blower fan – motor should run smoothly without vibration or squealing. Electrical connections should not be loose. Filter – Should be clean to visual inspection. When a higher rated filter is required (as for allergies) it should be designed for the system in use. Washable filters should be washed before the season starts and the filter should fit snugly in its mount. Duct work – Cleaning at least once a year is important and the spring is ideal as dry dust accumulates during the winter heat cycle. This dust can absorb moisture in the more humid summer conditions. Look for proper air flow at each outlet. If your vents have a directional feature, try it out – some require lubrication and all need cleaning. Supply lines – should have no visible leaks or damage. Copper tubing should not be dented or bent because restrictions in coolant flow will lower efficiency. Heat exchange unit – Clean any dust/dirt build up and recheck for icing after the system has been running for a few days. Drain – condensation should be allowed to drain from the cooling unit – check for obvious clogs in drain tube and watch for fluid buildup when the unit has been in operation for a few days. Units with a pump can be checked by moving the float to see if the pump turns on. Thermostats and remotes vary greatly between products. You will have to check the operation of your thermostat based on its specific design features. If it is a batter style it’s a good idea to replace batteries in the spring. Also check to be sure the system turns on and off as expected, based on the settings you select. Power down the unit by shutting off electricity at the electrical box before doing maintenance on the outside compressor. Air flow – clear any obstructions from around the outside unit that might impede air flow. This includes any leaves or vines that may obstruct the unit as well as any trash that has accumulated behind it. Heat exchange – Clean the accessible metal fins and the fan blades. Make sure they are dry before running the unit. Lines and electrical connections – should show no visible damage and should be anchored properly. They should not disconnect with a gentle tug. 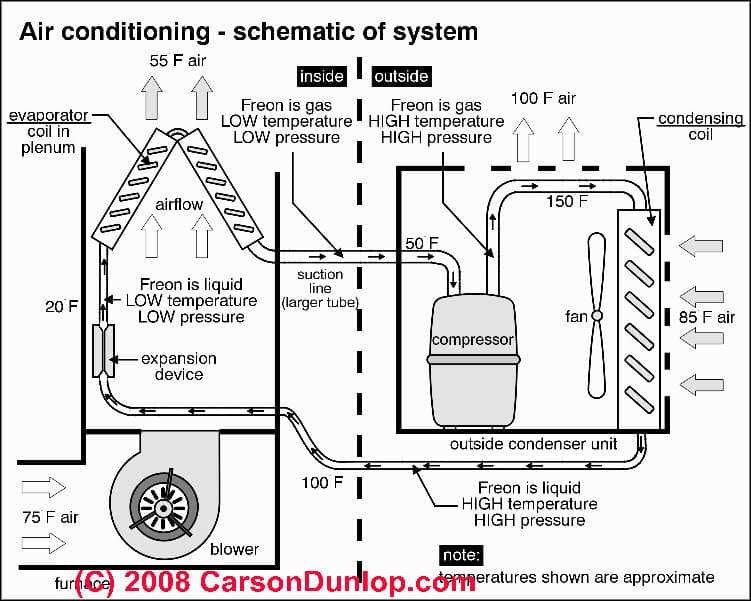 Do run your system after an initial inspection before the summer cooling season arrives. You should run the central air conditioning for several hours to make sure it is working properly. Do spend some time learning about your specific system and the names of the major components. You’ll need to know this when talking with a contractor or looking up information online. Do know where the power supply to your unit is located and how to shut it off. Do try to get any professional inspections and repairs done before the busy season in your area. This is usually in the early spring, between the winter heating season and the heat of summer. Do consider running ceiling fans or room fans to increase cooling efficiency in times of high heat and greater load on the system. Do identify and choose an HVAC company in your area before you need service. The time to find out who is reliable, qualified and reasonably priced is before you need service. This may be the dealer you purchased from or a company recommended by someone else. Keep their number available for when you eventually need it. Don’t try to handle repairs you are not qualified for – you can easily void your warranty, cause further damage, or hurt yourself. Don’t hesitate to purchase a new filter if you need one. This is the number one owner level chore that is overlooked and causes problems. Don’t panic. If trouble arises (a leak, smells, vibration or noise) you can safely shut the system off at the outdoor power supply. Smoke and fire that continues when there is no power is a reason to call for emergency help, but all other problems can be scheduled with an HVAC technician. Many people don’t think much about their HVAC system as most of time it will give the indoor comfort needed without a problem. When you think of it, what other appliance in the home except for the refrigerator or freezer, runs day and night when needed, and in most cases without you knowing it is running and doing its job. However, if not maintained properly, to include preventative maintenance during season change, it could become a real inconvenience and might also become a very costly problem.